Dr. Alex Gee talks with Pastor Peter Ahn about community development locally and internationally. Peter reinforces the need for empowering a multicultural leadership approach in local communities. He has demonstrated raising up local leaders and resourcing them to make change on their own in the Englewood community of New Jersey. Dr. Gee and Peter discuss the power and beauty of the African American and Korean communities coming together for change. 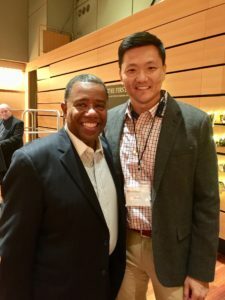 Click this link for an article that Dr. Gee and Pete Ahn wrote together for Covenant Companion Magazine, the Evangelical Covenant Church’s Magazine. It directly shares about the current state of racial disparity within the Evangelical Covenant Church, and their hopes for the future of the denomination.